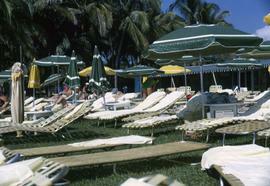 Colour Kodachrome 35mm slide depicts lawn chairs and umbrellas set up on grass. 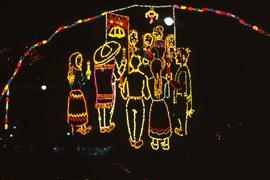 Colour Kodachrome 35mm slide depicts a light display of a group of people holding candles under a piñata against a black sky. Colour Kodachrome 35mm slide depicts a man with his back to the camera holding several balloons in both hands and balloons on his head next to a sign that reads: "Alameda Central, Mexico".